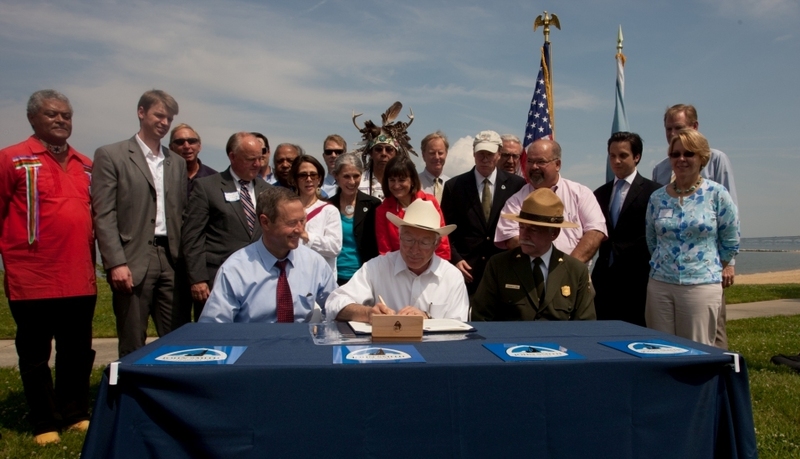 Earlier this month, Secretary Ken Salazar announced that he would be retiring from the Department of the Interior (DOI) by the end of March. Salazar, a Democrat who served for the entirety of President Obama’s first term, had previously been a Senator from his home state of Colorado. In declaring his intent to leave the administration, Salazar joined several other departing high profile figures on the “environment” team, including Lisa Jackson, Administrator of the Environmental Protection Agency, and Jane Lubchenco, National Oceanic and Atmospheric Administration Administrator. Salazar’s legacy will likely hinge on the impacts of his energy policies, including the DOI’s handling of the Deep Water Horizon disaster and subsequent re-vamping of drilling safety standards, as well as his support for renewable energy projects on public lands and his role in settling Cobell vs. Salazar. However, he also should be recognized for his commitment to the field of large landscape conservation, in particular his emphasis on collaborative models and public-private partnerships. Shortly after taking office in 2009, Salazar began discussing the idea of a “Treasured Landscape” initiative aimed at bringing diverse stakeholders together to conserve both federal and private lands. Based on experience with Great Outdoors Colorado, the Secretary and his staff hoped to draw support from local, state and national government agencies as well as nonprofit entities like land trusts and the private sector. The program suffered negative publicity within a year however, owing to the leak of an internal departmental memo outlining potential future National Monument designations on Bureau of Land Management Lands in the West. A testy exchange with members of Congress followed (this press release from Congressman Bob Bishop of Utah gives a bit of the tone) and, whatever the veracity of the document or its plans, the leak made “treasured landscape,” a dirty word and undoubtedly slowed momentum on some aspects of the program. Enhanced support for urban parks and community green spaces. In late 2012, Salazar signed a Secretarial Order establishing a formal AGO program within the DOI. The Order identified projects in all 50 states and included a list of landscapes of significance (take a look here), with a focus on working lands, rivers and urban parks. The Secretary also recently oversaw the establishment of a network of National Water Trails and the National Blueways System to conserve and promote outdoor recreation on key rivers. In addition, during Salazar’s tenure, the US Fish and Wildlife Service started the Landscape Conservation Cooperative program and the National Park Service committed to making “Scaling Up” a key point in its 2012 Call to Action. Not a bad legacy for four years on the job! So what is next? The short list of candidates is already growing. Whom would you nominate? Share your thoughts!